There were more records for Spartan ALISON WOOD on Saturday. The Track and Field Championships of the Eastern Masters Athletics Club were held at Garon Park in Southend on Saturday. Starting in bright sunshine, the clouds rolled in during the day, but luckily most events were completed before the downpour. With the very strong and gusty winds giving a headwind in the home straight, many of the race times and jump run ups were badly affected. 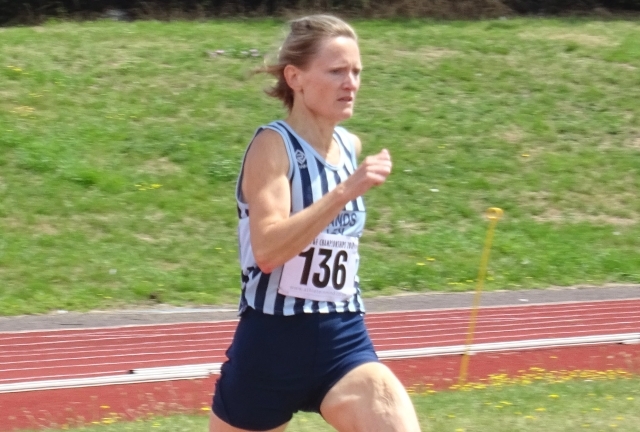 Given the conditions, Alison Wood produced an outstanding performance in the 800 metres race for women over 50 to not only win the race but also to reduce the Championship Record by over 5 seconds to 2 minutes 33.0 seconds. She followed this up later in the afternoon by also breaking the record in the 400 metres with a time of 69.3 seconds. The other Spartans present all ended up with medals. Tessa Stephenson took Gold in the 400m for women over 55 in a time of 80.6 seconds, Silver in the 100m in 16.4 seconds and Silver in the Shot Putt with 7.53 metres. Sharon Crowley took Gold in the 2000 metre Walk for women over 55 in 14 minutes 24.5 seconds. Dave Stephenson took Silver in the 100m for men over 50 in 14.2seconds, Bronze in the Long Jump with 4.10 metres and also competed in the Shott Putt finishing with a distance of 7.98 metres. There is an EMAC track and field fixture in Stevenage this Wednesday evening. JOHN HARRIS ran the Panshanger 5 five mile race in 35 minutes 1 second. He was second man 50 plus. ERICA GRAYSON commented it was very hilly but ran a new personal best of 45 minutes 45 seconds. It was hot and hilly for JENNY PAUL who finished in 50:49. There was a new personal best for TIM SABAN who ran the Bedford AAA 10K on Friday night in 41:33. Come and watch the relays in Fairlands Valley Park this Thursday evening. Dozens of teams have entered the 3K relays organised by Fairlands Valley Spartans. The course, in the top half of the park is ideal for spectators and the event starts at 7.30p.m. GRANT RAMSAY returned to Stevenage parkrun for the first time since New Year’s Eve and duly romped home as first finisher, crossing the line in 17mins 41secs. Second Spartan finisher was NICK GILL who rushed round in 21:12, with Darren EMMERSON (23rd, 22:24) and MARTIN DUDLEY (25th, 22:31) also finishing in the top 30 men. LEE PICKERSGILL (26:08), ROBERT EVANS (26:34), CLIVE CANNON (26:37), STEVE ELDER (28:44) and JOHN WALSH (31:58) were the other Spartan men running. KAREN ELLIS was the first Spartan woman home, finishing 19th in 26:58, a new course personal best (PB). J O BOWDERY finished in 30:35, with SHANI HUNT (37:05), CAREN THAIN (37:06) and KELLY CHAPMAN (37:41) also completing the 5k course. Hertfordshire has gained a new parkrun this weekend, at Westmill near Ware, and eight Spartans turned up to try out the challenging, hilly, offroad layout. TIM SABAN, who is in fine form, was 19th in 22:21, with JOHN ROXBOROUGH the next Spartan, 29th in 23:21. TIM ROBINSON (26:05) and CHRIS HOLLAND (26:43) were the other males. KAREN PALMER was the first Spartan woman, finishing 15th in 29:21. MONICA SMITHSON was next in 32:04 with TRACY STILES (37:35) and EMMA MARTIN (39:23) completing the Spartan octet. Elsewhere RUTH REILLY was the sole Spartan at Panshanger, finishing 21st in 27:05. Regular tourists VERITY FISHER and DANIEL SUTTON were at Torbay Velopark with Verity finishing as 3rd woman in a new course PB of 23:02. Daniel was 35th man in 23:14. DARYL STEVENS was at Weymouth and finished in 40:05. Also in the west country MADELEINE PRITCHARD finished as second woman at Chippenham in a time of 23:34. Finally PAUL MAGUIRE was 10th at Dolgellau parkrun in North West Wales in a time of 22:09. EMAC Track and Field at Stevenage on Wednesday 26th July. Fairlands Valley Relays in the Park, Stevenage on Thursday 27th July. Serpentine 5K in Hyde Park on Friday 28th July. Handicap 5K in Stevenage on Thursday 3rd August. Herts Senior 5K Championships at Hatfield on Wednesday 30th August. Herts Veteran 5K Championships at Hatfield on Wednesday 13th September. Herts Senior 10K Championships at Standalone on Sunday 1st October. Peterborough Half Marathon on Sunday 8th October. Stevenage Half Marathon on Sunday 22nd October. Cross Country at Trent Park on Sunday 12th November. St Neots Half Marathon on Sunday 19th November. Enter fast. Hertfordshire Five Mile Championship for Veterans at Hatfield on Sunday 26th Nov.
Bass Belle 10 near Royston on Sunday 26th November.